Onserts are sticky notes of varying size, shape and colour that are placed on the front cover of our free publications delivered direct to over 5 million households every week. 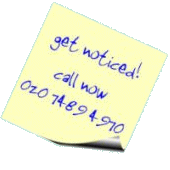 They are an innovative way to promote a product or service, achieving instant standout and maximum impact. With only one onsert being attached to each edition they are an exclusive, eye-catching tool to reach your customers. Used as stand alone marketing communication. Used to direct readers to adverts in the newspaper. Retained by customers for future reference e.g. store locations and contact details. Used as a source of information e.g. product specifications or service details. Used as coupons e.g. discounts, BOGOF and various promotions. They can be used in isolation or work alongside other media such as TV, radio or door to door material. They can be used in a national campaign or be targeted down to postcode sector using geographic, demographic and lifestyle criteria.